The Host Niko was amazing, like amazingly above and beyond. everything he recommended was great experience and good prices. The list he gives you are wonderful, can’t go wrong by following it . Read it. The shower and water was bloody fantastic, better than all of the hotels I have been to. Heated pool was amazing, great for a swim even during winter. Jacuzzi was just awesome. We had gotten a junior villa and this was more than what we expected. 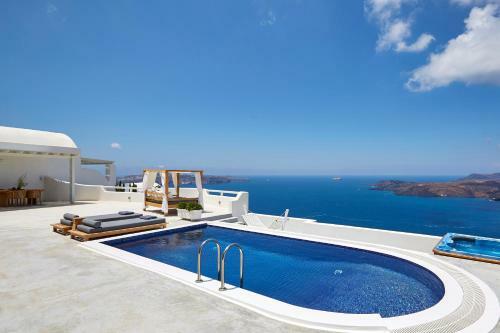 The room was very big with a plunge pool at the roof terrace of the villa. Breakfast was served on the roof terrace too! They also use Diptyque for hotel amenities. The manager Niko is very friendly and helpful and he even drove us to town after we just missed the shuttle bus upon arrival. If you are here for Honeymoon, i would strongly recommend this place. Nikos is the best ever hotel manager we've met. 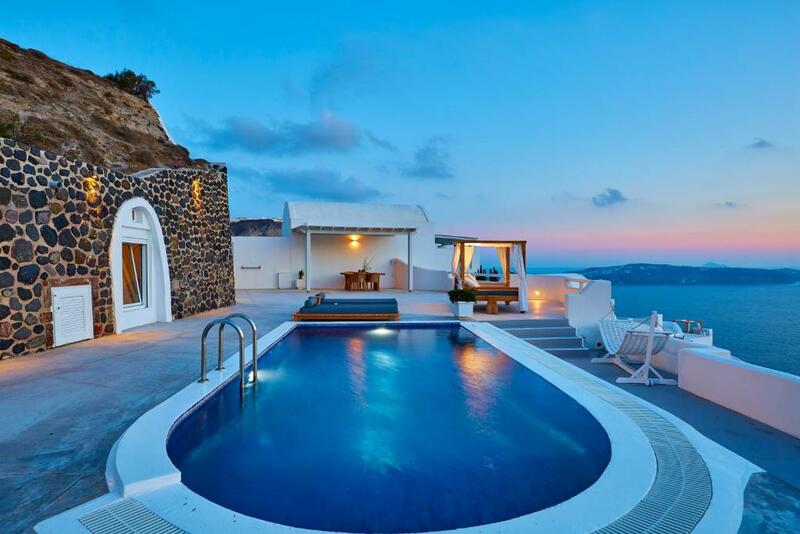 Villas are perfect. Views are unforgettable. Meal is great. It was a wonderfull place to stay, a little bit isolated but with such a beautiful back drop and with Niko looking after us it is highly recommended. The transport into Thira is easy and from there you can go to anywhere on the island via the local bus or taxi. The main part of Celestial Grande is Niko and his one on one attention, if you are concerned about getting around from this position....dont be as Niko will ensure that you enjoy your holiday. A brilliant location overlooking the ocean, perfect for sunset watching from the private balcony. Niko the manager is amazing - so friendly and helpful - took care of everything my wife and 18mth old baby and I needed. We were suprised with an upgrade to the honeymoon villa. Потрясающее место!!! Обязательно нужно здесь остановится, чтобы прочувствовать дух Санторини. Незабываемый вид, потрясающее отношение персонала, и конечно же, Нико, спасибо вам за прекрасные воспоминания! Мы были с малышом 3 месяца, кроватку предоставили без проблем. У жены было день Рождения, выполнили все пожелания, Цветы, ужин на закате, любой каприз исполнят тут же! Lock in a great price for Celestia Grand - rated 9.7 by recent guests. Perched on the edge of the caldera cliff, in Fira, Celestia Grand offers luxurious villas with private pools and hot tubs boasting spectacular views over the volcano and the Aegean Sea. Santorini Airport is 1.9 miles away. The air-conditioned villas at Celestia feature arched ceilings and minimal decoration. They come with a flat-screen TV, mini fridge, electric kettle and coffee maker. Each villa also has a living and a dining area, while free toiletries can be found in the bathrooms. Breakfast is served daily in the villas, while an a la carte restaurant operates during the summer months. A bar and a mini market can also be found on site. The lively centre of Fira is 1.6 miles away offering a wide variety of dining and nightlife options. 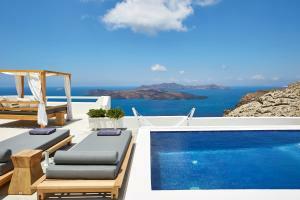 Athinios Port is 5 miles away, while a super market can be reached at 350 yards. Free private parking is available near the premises and free Wi-Fi is provided throughout. Celestia Grand has been welcoming Booking.com guests since 27 Sept 2013. When would you like to stay at Celestia Grand? Featuring a private pool with views over the caldera and the volcano, this minimally decorated villa includes a flat-screen TV, DVD player and free toiletries. 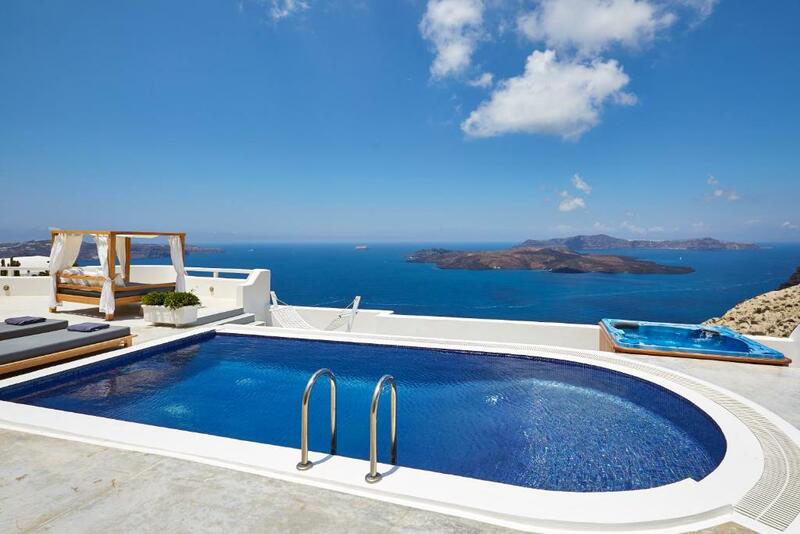 Featuring a large cliff-side terrace with a private pool overlooking the caldera and the volcano, this minimally decorated villa has a hot tub, flat-screen TV and free toiletries. This honeymoon villa features a large private pool with views over the caldera and the volcano. It offers a flat-screen TV, DVD player and free toiletries. 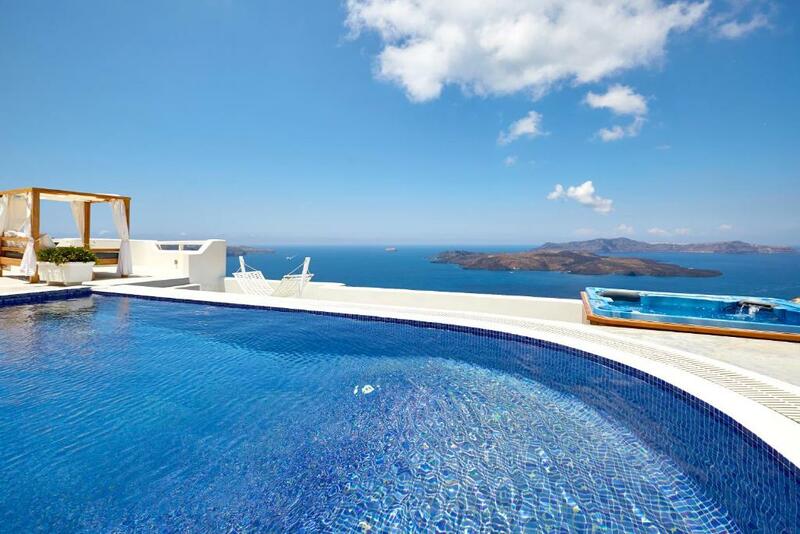 Featuring a sauna and a private pool with views over the caldera and the volcano, this minimally decorated villa includes a flat-screen TV, DVD player and free toiletries. 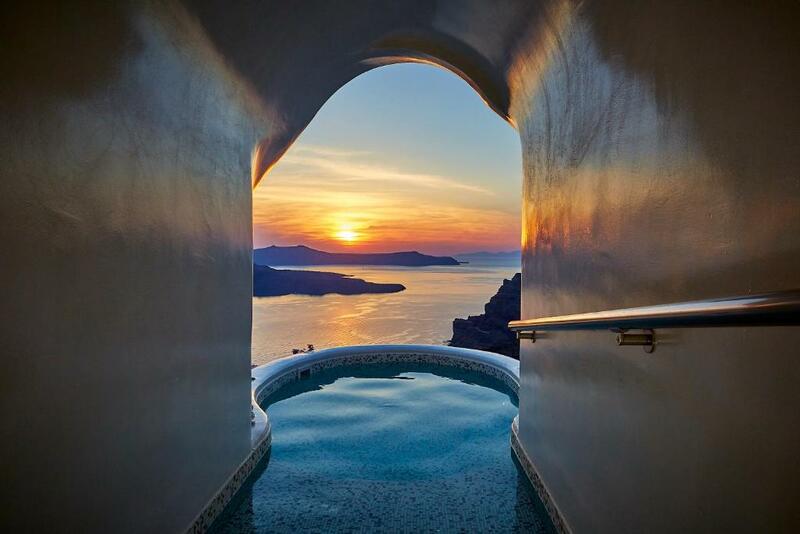 Featuring a large cliff-side terrace with a small pool overlooking the caldera and the volcano, this minimally decorated villa has a hand-crafted hot tub, king-size bed, flat-screen TV and free toiletries. This villa features a balcony, electric kettle and seating area. 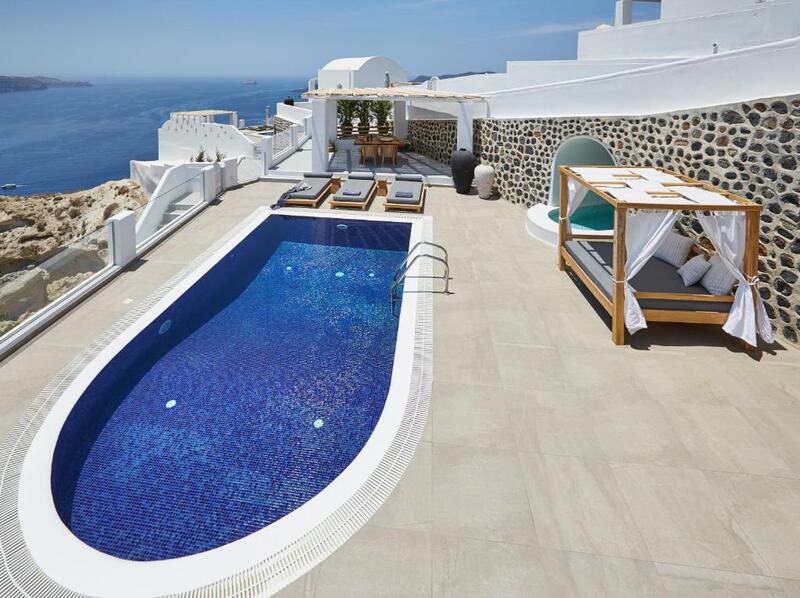 Join us at the hotels and resorts of the Caldera Collection in Santorini and experience more than the mere luxurious holiday in Greece. 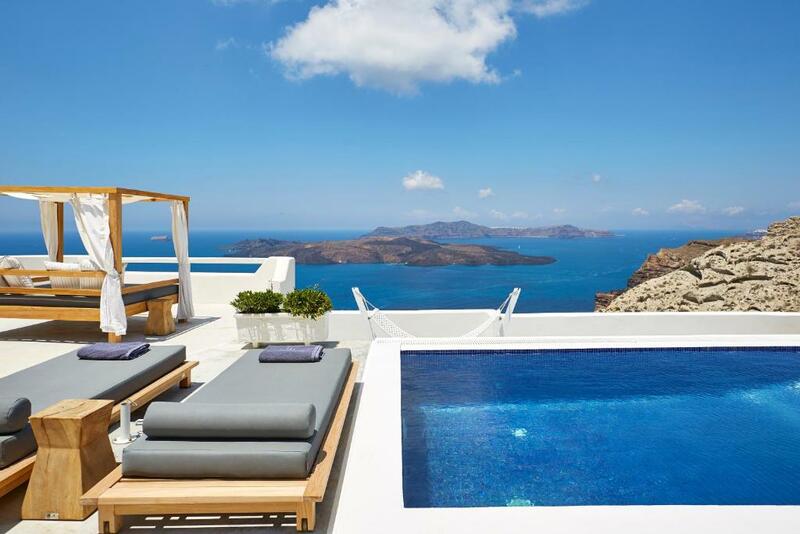 Engage in our suggested one-of-a-kind experiences that will transform your getaway to the Greek islands into a life changing and memorable vacation whether you are a family or a couple, a wine and food lover, a honeymooner or a VIP. Our aim is to add ounces of spectacular images in the album of your minds and hearts. Whether you are seeking for a thrill or for some relaxation, whether you wish to explore or indulge, we certainly promise that your holiday moments will linger long after the vacation is over. House rules Celestia Grand takes special requests - add in the next step! Up to two children from 6 to 14 years are charged EUR 80 per person per night for extra beds. Up to two older children or adults are charged EUR 100 per person per night for extra beds. Celestia Grand accepts these cards and reserves the right to temporarily hold an amount prior to arrival. A bit far from the town, But there is free shuttle and it’s an easy 30 minutes walk which we did. Or just ask Nikos for a taxi. Easy. 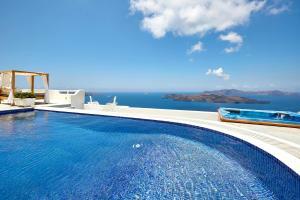 Amazing property with amazing views of the Caldera. The rooms are extremely clean, breakfast is excellent. Nikko really made our trip! Nothing. There is nothing that you cannot like in this hotel. Everything is awesome. Could of had some more English channels on tv. But that's being picky everything was nice. Our stay was incredible. The room was clean and absolutely gorgeous. The views anywhere on the property were spectacular. Niko, the villa manager, made sure we were always taken care of and made himself available 24/7. The included breakfast was AMAZING, they brought right to your room every morning outside overlooking the incredible view. The location was perfect, it was about 10 minutes from town so you didn't have tourists all around you. Windy while we were there but we had a good time. Manager Niko makes the trip. Very attentive and helpful. Pool not heated, may be warm enough by July !